Read on to learn why ankle sprains can be much more than just a "twisted ankle." There are many things that you should know about this injury and how to deal with it and decrease your chance of re-injury! It happens all the time: You step wrong, land wrong from a jump, miss a step or in some cases just lose your balance and twist your ankle. While this is a common occurence on the whole, it should not be under rated. This injury comes in all forms of severity and failing to seek treatment early can lead to prolonged pain and dysfunction. Ankle sprains by definition are an overstretching of one or more ligaments around the ankle. Twisting your ankle can be much more than a sprain and the only way to be sure that there isn't damage to other structures (namely cartilage or bone) is to have a thorough exam by a professional. When someone experiences a "twisted ankle," this injury is at the least an overstretching of one or more of the ligaments of the ankle joint. Ligaments are tissue in the body that connect bone to bone and they are present at every joint. In the ankle, there are 3 main ligaments on the outside of the joint and two main ligaments on the inside. There is also a ligament that holds the fibula and tibia (the two main ankle bones) together. Depending on which way the foot twists during an injury, ligaments in any of these places can be injured. 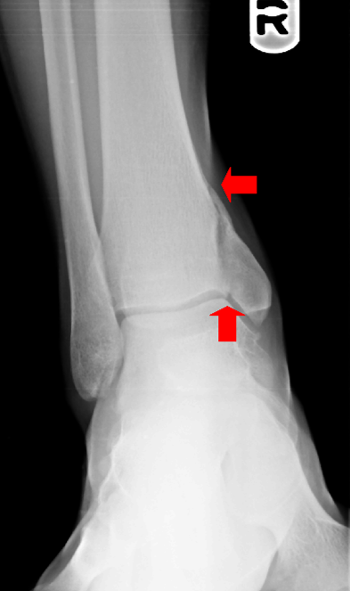 Most commonly, the outside of the ankle is affected. The position and severerity of twisting that occurs will dictate whether one, two or three of these ligaments is overstretched - and this also will determine HOW overstretched the ligament becomes or if it will physically tear. Ankle sprains are graded as I, II, or III. In a grade I sprain, the ligament is overstretched. In grade II, there is partial tearing of the ligament. Grade III sprains mean that the entire ligament has ruptured off of the bone and, in some cases, the ligament can pull a fragment of bone off with it (this is called an avulsion fracture). Even in instances where a Grade I ankle sprain occurs, if left untreated, there is a high incidence of reinjury if the sprain is not properly identified, treated and rehabilitated. When the ankle is twisted, if the ligaments are over stretched or torn enough, this allows an excessive motion within the ankle joint that can lead to the internal ankle joint surfaces bumping together and this damages cartilage. An important thing to note about cartilage is that beyond the very early years of life, it has no ability to regenerate. This is why when an athlete has a torn meniscus in the knee (meniscus is made of cartilage) the treatment is either to immobilize the area, "deal with the pain" or remove the loose cartilage. There are a few ways to transplant cartilage that covers joint surfaces, but the longer treatment is delayed, the less likely the transplanted cartilage will survive and be functional. Detecting an injury in cartilage is difficult and sometimes requires an MRI or CT scan to visualize. As with the knee injury mentioned early, if damage to the cartilage causes irritation or pain within the ankle joint, the loose pieces often need to be removed to restore more normal and less painful range of motion. There are instances in which the ligaments are stronger than the bone - whether due to anatomy or due to the particular energy from an injury. In these cases, twisting your ankle can lead to damage to the bone. This usually means a fracture or break in the bone. Because all people have different pain tolerances, there are cases when an ankle fracture occurs and is not suspected initially. If gone untreated, fractures can move into bad positions which alters a joint and can lead to further damage within the ankle joint. If the bone fragment moves enough, blood flow can be compromised and this can lead to a 'non-union' or a condition where the bone fracture does not heal. This can be a very painful condition and is often not reversible. Initial treatment of an ankle sprain is what we refer to as RICE - R-rest, I-ice, C-compression, and E-elevation. Resting the injured area allows your body to lay down scar tissue and begin to heal. Icing keeps inflammation to a minimum to decrease pain. Compression helps to milk the fluid and swelling out of the ankle. Elevation also helps to decrease swelling. This phase of treatment is typically for 1-2 weeks, again depending on the severity of the injury. Generally speaking, the next component to treatment is rehabilitation, which comes in the form of strengthening, stretching, and balance training. In mild sprains, these exercises may be manageable at home - provided you are diligent in performing them. In other cases, physical therapy is a wonderful way to get your ankle back to where it was before the injury - or in most cases it will end up stronger and more able to compensate when an injury is about to occur. When an ankle injury occurs, timely assessment is key to determining the appropriate course of treatment. Unless a simple twisting of the ankle only causes a couple moments of pain and no swelling, it should be assessed by a foot and ankle specialist. With all the advances in technology and human health, we still have not mastered the skill of x-ray vision and until proven otherwise your ankle should be treated as a fracture. If you have suffered an ankle sprain, call Prairie Path Foot & Ankle Clinic today! We can typically see patients within 24-48 hours after the injury and can get you on the road to healing! Don't live with pain and don't brush off a twisted ankle!